1020. Many think that the church ought to be called St Wilfrid’s because of the bishop’s strong association with the site. 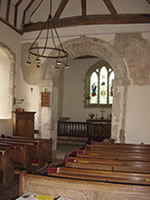 Today, Corhampton Church is famous as a wonderful example of a small village pre-Conquest church that has remained almost unaltered from the time that it was built. It is one of the most important Saxon churches in Southern England, a place of rare peace and beauty. It is a church of holiness whose walls seem to resonate with the prayers of a thousand years. The church is built on a mound within a circular enclosure suggesting a very ancient place of pre-Christian worship and Wilfrid may have joined the Saxons as they worshipped their pagan gods and told them about the one true God whose Son had died for them on a cross at Calvary. Encouraged by his ministry on the Isle of Wight and at Titchfield, Wilfrid may well have sailed up the river in the company of newly-converted Saxon leaders to meet the people of ‘Cornhamptone’. the yew tree by the entrance is probably older than the church! The Saxon stone sundial to the right of the porch may have been used by Wilfrid - note its eight ‘tides’ rather than 12 hours. The 12th century wall paintings which have only been rediscovered in the last century - the Expulsion from Eden on the chancel arch; and, within the chancel, St Swithun with the woman and her basket of eggs (which he is supposed to have miraculously restored), and Swithun bringing back to life a young man who had fallen into the Itchen and drowned. The original altar stone and stone sanctuary chair. 7Then came the day of Unleavened Bread on which the Passover lamb had to be sacrificed. 19And Jesus took bread, gave thanks and broke it, and gave it to them, saying, "This is my body given for you; do this in remembrance of me." 20In the same way, after the supper he took the cup, saying, "This cup is my blood of the new covenant, which is poured out for you. (Luke 22). Wilfrid would have taught the Meonwara about the Last Supper, told here in Luke’s Gospel. How Jesus had become a ‘Passover Lamb’ for all nations, including the Meonwara. Jesus had allowed Himself to be sacrificed on the cross as the means by which the Saxons could be forgiven their sins, achieve salvation and be spared eternal death. Jesus had understood all of this, Wilfrid would have explained, as He shared the Last Supper and prayed over the bread and wine. Jesus was asking His friends to participate in His own sacrifice of Himself and Wilfrid would have been obedient to Jesus’ invitation by celebrating the Holy Communion in simple little ceremonies alongside the Meon. He invited the Meonwara to participate in this ‘mystery of faith’. And Christians continue to derive great comfort and spiritual strength from the Communion today – that, somehow, we may evermore dwell in him and he in us.